The Fw 191 was designed as a high-altitude, pressurised, bomber. 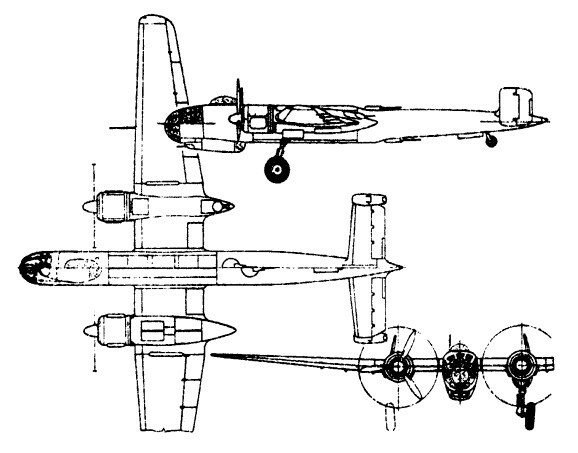 Focke-Wulf built a technically complex machine around engines which did not exist, and the operation of the majority of the components was electric, which complicated problems. The second prototype had the elecric systems replaced by hydraulics. Development problems caused its abandonment. Three built. Props, three-blade metal VDM fixed pitch. Range: 3860 km at 490 km/h, 1800 km at 565 km/h.